Hey! Has anyone seen my…. nevermind, I found it! Meet Becky. She lost her brain. Brainless Becky. She cooked the same dish one too many times after her brain fell out. It wasn’t a pretty sight. Wandering around the house, looking for her brain while taco meat fried on the stove for the hundredth time in two months. Feeling overwhelmed by the amount of prep needed for traditional food dishes, she keeps going back to the same meal or three because she can’t get it together to fix anything else. Becky looks about how I feel some days. Maybe it’s just me, maybe it’s my age, maybe its how busy I am, maybe it’s hormones. But I suspect I’m not the only one who gets stuck in a rut, frustrated, cooking the same fast and easy dishes over and over. And hearing the same complaints from the kids over and over. And over. At my house, that fast dish is taco meat with beans and tomatoes served over rice. Some days I get so buried in my work and loose track of time until I hear “I’m hungry!” from a short folk, look up and discover it’s 5:30. Dinner is due on the table in 25 minutes. That whole chicken I had thawed won’t get used tonight. I’ve been so busy since October that my batch cooking stash is gone, my time is short and my creativity is floundering. It’s time to get some resolve going and fix it. Since it’s New Year’s, I’ve resolved to break out of that rut. And I’m going to publicly put myself out there in an attempt to hold myself to that resolution. I need to improve my kitchen organization and get the freezer better stocked so I can have those brainess days without serving taco meat over rice four nights a week when I’m buried under my work and the hobbits are consuming food as fast as I can ferry it to the table. The fact is, I’ve got a heavy work load going this year. That gives me less time in the kitchen when I’m not working on recipe testing. My full schedule is being stretched by my goal list and the needs of my growing business. And my two now officially eat more than I do at each meal. They’re 7 and 9 and I find myself turning out increasing amounts of food. I’m scared to see my work load and my food bill once they’re teens. I’m sure this process won’t be pretty. Nor will it be edited. I’m sure this will hold many laughs for you at my expense. But I need to do it. And if my household needs it, I imagine I’m not alone. Surely there are some of you who are spread just as thin and have just as little time. So, in an effort to get started, I cleared my refrigerator freezer out. Here’s what it looks like now. It desperately needs a wipe down but it will wait until Flylady prompts me to do it again. What? Doesn’t every mother’s freezer have a pair of bubble-gum smeared sweatpants in it? 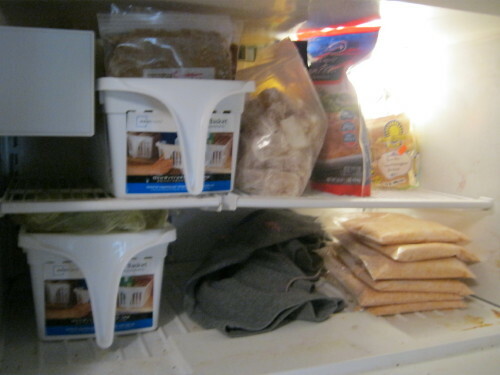 The top shelf holds the bin of snacks- cookie dough, graham cracker dough, coconut oil candies. Beside it is my bag of chicken stock cubes. Beside that is my emergency stash of GF bread bought for $1 a bag that will be used to make french toast casserole this weekend before it goes bad and the pound of salmon we’ll be eating tomorrow night. The bottom shelf has a bin of odds-&-ends including ginger, prepped veggies (already cooked carrots, celery and onion) and the like. Beside that is the cheese that’s freezing flat before it gets transferred to the chest freezer this afternoon. In the door, we have my home-ground flour, my husband’s quart of ice cream, my baggies of liver and yogurt cubes (that’s liver AND yogurt, each in separate cubes and in separate baggies, lest someone should wonder why liver ‘n yogurt were inserted into my blender at one time) and some frozen fruit and veggies. From here, I get my freezer stocked with parts of meals (already-browned beef, cooked chicken cubes, grated liver and prepped veggies) and already finished meals to break out of that rut. Stay tuned, next Friday we’ll take another pic and track my progress. Being accountable to take that picture every week will become a motivation to get it done. Come share in my embarrassment and break out of your rut. What meal do you cook over and over when you’re stuck in a food rut? This post was shared on Make Ahead Monday. Q&A: Can You Work an Outside Job and Still Do Real Foods? You know, spaghetti is something I should make more. My kids love it. We’re thinking alike! I love Flylady, too. I’m also on a mission to start filling up my freezer, as I’ve got a little one due in May, and I hope to be prepared for then. I also got really sick a few weeks ago and we kept having to resort to eating out b/c I didn’t have the stamina to cook and my poor husband can’t boil noodles. I’m doing a weekly link-up over at my blog each monday called “make-ahead mondays”, I’d love for you to pop over to learn/share some information! Sarah recently posted..Sodium Benzoate – What is it? Batch cooking is a life saver for the first couple of months after giving birth. I did it with both of my kids and it was a huge blessing. Thanks for posting about your carnival, I’ll go check it out! I’m also a flybaby, (periodically) – working on dethugging my kitchen this AM, as part of babyproofing for my 7 1/2 month old grandson!! I make lunch for my daughter & self 4 days a week, & it’s fun to try new GF recipes! I love Flylady. I need more time to be able to stick to it consistently. 2Tbsp of Thai Kitchen or some other GF curry paste,2 Tbsp of GF fish sauce, 2Tbsp of rapidura or other sweet or not and 1can or box of coconut milk, simmer and add the protein til cooked through then with green beans or peas tossed in at the end. served over rice. Usually chicken, some times shrimp. But is once a week too much? Connie, fish sauce is something I’ve avoided since I haven’t been able to find a GF brand. Which brand are you using? Thanks for sharing your post over at Raising Isabella! Hope to see you back again soon! Your confessions are doing my heart good today. I’m really depressed and feeling hopeless. I can’t do much to improve our diets until the food stamps refresh but when they do, I’ve got some ideas that I’m going to implement. Some will take effect immediately, some are long term. In the meantime, I’ve got a pound of black beans soaking for tomorrow and I’ve got a pot with some freezer burned beef and sliced carrots that I browned in garlic, onions, salt and pepper with a gallon of mystery meat bone broth (I think it’s a combination of beef and lamb but there may have been some pork bones in there) to simmer until dinnertime.